Four Seasons at The Promenade is an exclusive 55+ community that's small in size yet big on amenities. In New Jersey's beautiful Somerset County, Four Seasons at The Promenade features upscale living in a secure, gated community. This fabulous K. Hovnanian property includes just 160 homes, making it a quiet retreat for discerning homebuyers age 55 or better. 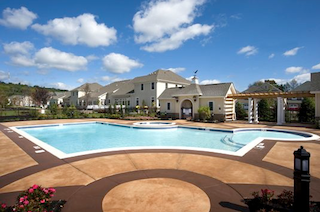 Yet it also provides an active lifestyle through its spacious clubhouse and outdoor recreations. Four Seasons at The Promenade opened in Warren, New Jersey, in 2007. The 55+ community was designed to offer an active lifestyle with varied amenities and an exciting line-up of social and recreational activities. Development continues today with elegant single-family and attached homes designed by K. Hovnanian, allowing homebuyers to choose between available new construction or resale homes. The upscale homes within Four Seasons at The Promenade provide several options for discerning homebuyers. Upon completion, the community will include 122 single-family homes and just 38 attached townhomes. Both styles include features that appeal to older homebuyers, such as first-floor master bedroom suites. Townhome highlights include two to three bedrooms, two to three-and-a-half bathrooms, two-car garages, private decks or patios and ample storage space. Single-family homes offer the greatest diversity with floor plans ranging from approximately 2,500 to 3,200 square feet of living space. Like townhomes, single-family homes typically feature two or three bedrooms, two to three-and-a-half bathrooms and two-car garages. Those without a third bedroom include a separate den instead. Although many single-family homes include two stories, luxurious master bedroom suites are located on the first floor. Additional touches which appeal to active adults include gourmet kitchens, open floor plans, vaulted ceilings and outdoor living areas. 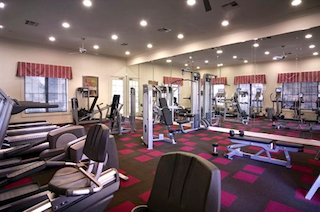 The clubhouse features a comprehensive line-up of amenities including a well-equipped fitness center. At the heart of the community, Four Seasons at The Promenade's spacious clubhouse welcomes residents and their guests. Highlights of this 7,300 square-foot facility include a fitness center with cardiovascular and strength-training equipment, an indoor lap pool, hobby and game rooms, and a social lounge with a cozy fireplace. The community's outdoor recreations include a resort-style swimming pool, a patio with an outdoor fireplace, two bocce ball courts and a picturesque gazebo. Four Seasons at The Promenade's grounds also feature walking and biking trails which wind throughout the community, and seven community gardens which make it easy for resident gardeners to get in touch with nature. In addition to the resort-style amenities, the community offers a lively setting with an activities calendar that lets residents be involved as much, or as little, as they desire. Residents can take part in exercise classes or planned trips, join a special-interest group or enjoy a wine tasting or an afternoon tea. With its impressive homes and inviting clubhouse, Four Seasons at The Promenade offers luxurious living for active adults who want to settle in New Jersey's popular Somerset County.